as I pass this way. Your winged airs bring relief. I took a nap earlier and now I am wide awake. The sound of the Hermit Thrush is so beautiful and your hub is another example of talent and beauty mixed nicely. Thank you for sharing. I hope you are safe and it is amazing how bad weather can affect so many people around the world while other people have good weather at the same time. Take care and have pleasant dreams. Thank you Kim, for your lovely comment. Much appreciated my friend. Hello Peg, thank you so much. I'm so happy you enjoy this one. You seem to have deciphered the actual lyrics of this bird's song! Both sound so mellifluous. Hello Genna! Thank you so much. Such beautiful tones this bird has, like gentle, melancholy woodwinds...and what beautiful poetry, Verlie, that sings as well. All good now Nellieanna, didn't float away. Need to start taking the emergency preparedness seriously, put together a kit with at least the bare essentials ready by the door. I left with nothing but a blanket and my purse. And the car was nearly out of gas. Wouldn't have got far in any event. Thanks for coming back. See you soon I hope. Beautiful day here, off to work as soon as the ice melts (freezing!). Soothing and very comforting to me, dear Verlie. Yikes! Stay safe, dear friend! Yes Nellieanna, good idea. Let's do that. Today is scattered. Had a Tsunami warning here, and had to head for higher ground in the middle of the night (Big earthquake in Alaska around 1:30 am.) Home now, tsunami was a non-event. But I think I'm going to need a nap. Way too much excitement for me! Kari, that is too funny, a born performer. Have never seen one singing, only heard it. Thank you for the read, much appreciated. When you hear it live, it is impossible not to feel transported. Appreciate your comment. I'm doing well, but I miss you, too! Thanks for telling me that! This looks like an ideal place to meet with good Hubpage friends!! Bird song relaxes me. I think the bird in the video must be a ham in the beginning. He keeps looking right at the camera, lol. I found your poem lovely. Bronwen, thank you, I've been playing it over myself. Appreciate your reading and enjoying. Hey Peg, thanks so much. I'm loving that you loved the Hermit Thrush song. Great capture in both poem and video. Congratulations on a delightful article. It needs playing over again to be truly appreciated. 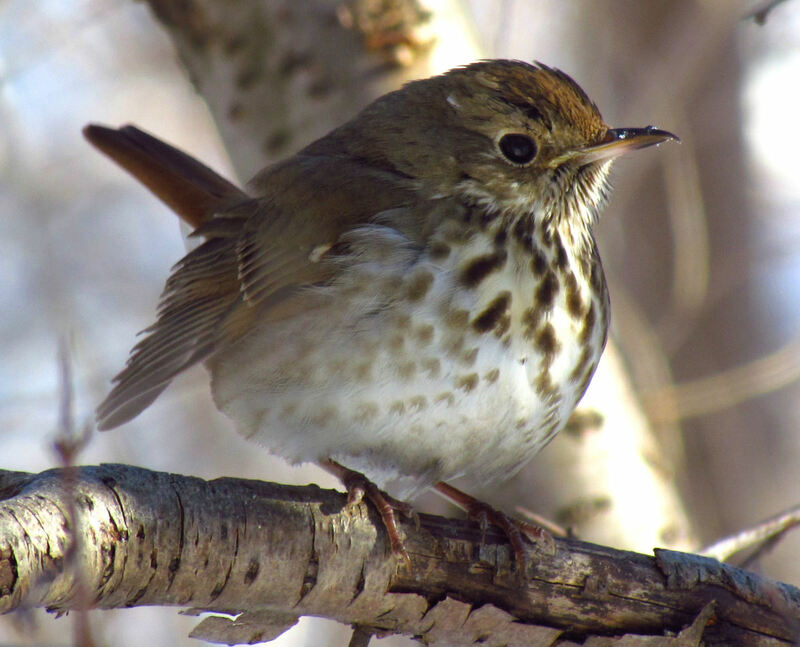 Your poem beautifully captures the essence of the Hermit Thrush's song. It truly is flute like. Nature's tunes definitely can lift the spirits. Not only is he beautiful (handsome), he's a great singer with an awesome song. Loved this. Aw, Ian, trust you to show up for 2018 poetry offering. Thank you! So good to see you. Happy you appreciate. Miss you Ian. 15 months ago from Norbury-sur-Mer, Surrey, England. U.K.
How lovely. What a sad little call. But what a lovely and evocative poem to go with it. You've never lost your touch, have you, Verlie? Manatita, Thank you, where are you? Not seeing you on Hub Pages. Bill, Thank you, I'm happy you have poetic needs! Appreciate you stopping by. Your style matches my poetic needs quite nicely, cramming a plethora of images and reflections into a minimal number of words. Well done! Mike! Thank you. Appreciate you reading my first new poem in a very long time. Good morning Verlie - Good to see a notice that you published. Yes, the hermit song. It may be on everybody's mind. Beautiful writing. Good morning Nellieanna! Thanks for finding me...How are you doing? miss you. Lovely feelings and words, Verlie! Touching, heart-felt poem. Nice images. Much Love ... much.